Casey is destined to serve a special duty to her owner and that is to inform him of an impeding seizure. 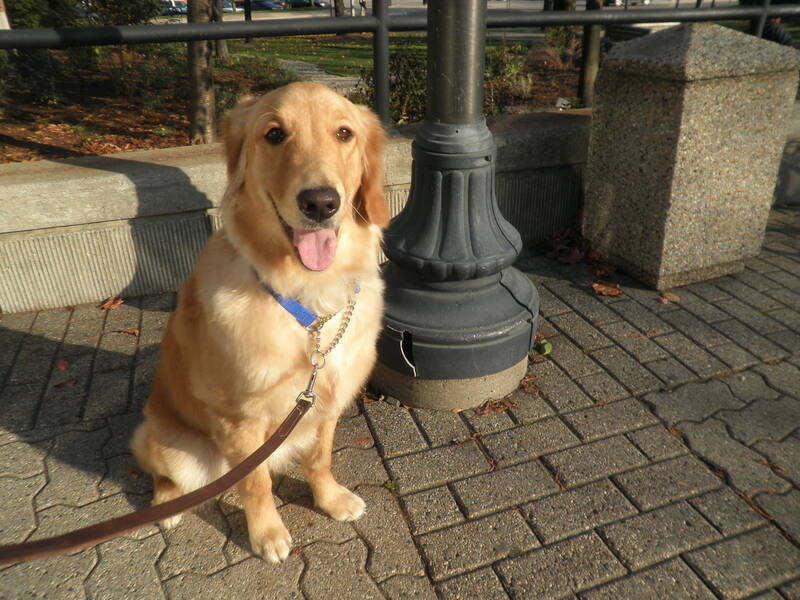 In reality Service dogs are born with a certain temperament and personality. But her owners love her and are willing to do whatever it takes to make it work. Casey is 10 months old and is all puppy. She is quite active, but has more of a nervous hyper temperament and gets startled easily. She is very manipulative and knows how to get what she wants. One of the games that Casey likes to play is to race around the yard and do a full nelson on the owner’s poor Mom. She jumps on guests and sometimes when you try to make her do something she will roll on her belly as she kicks out her feet in all different directions. Oh and I almost forgot about getting car sick. Which can be a problem if she is supposed to travel with her owner all the time. The actual training to be a seizure response dog will be done by a certified Service Dog Trainer provided she passes the initial evaluation. A seizure response dog requires special training and has to have the right personality. There have been many cases where a dog has actually bitten the person having a seizure. 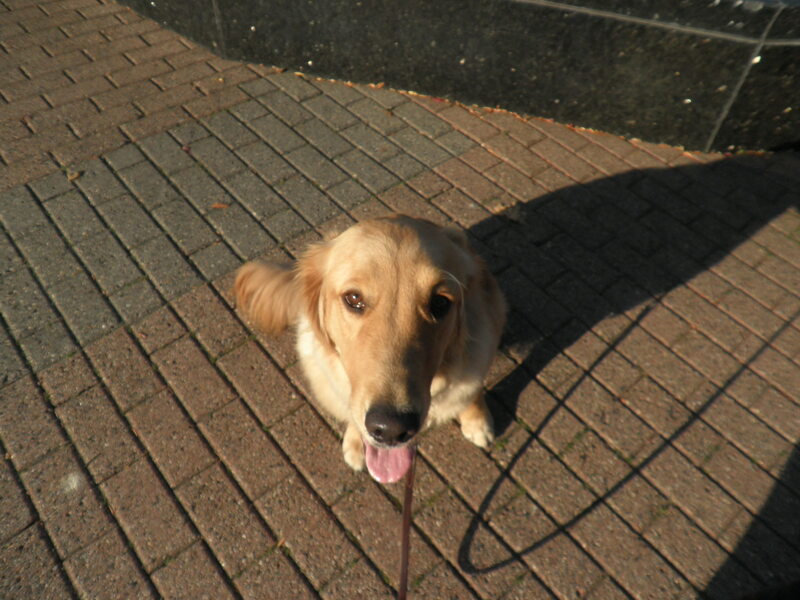 The major reasons that Casey went to bootcamp is to address the jumping, nervous hyper behavior and to socialize her so that she isn’t so fearful about her surroundings. Even when she sits still it seems like her head and eyes are swinging back and forth and her eyes show how nervous she is. The first few training sessions were just for brushing up on her obedience. 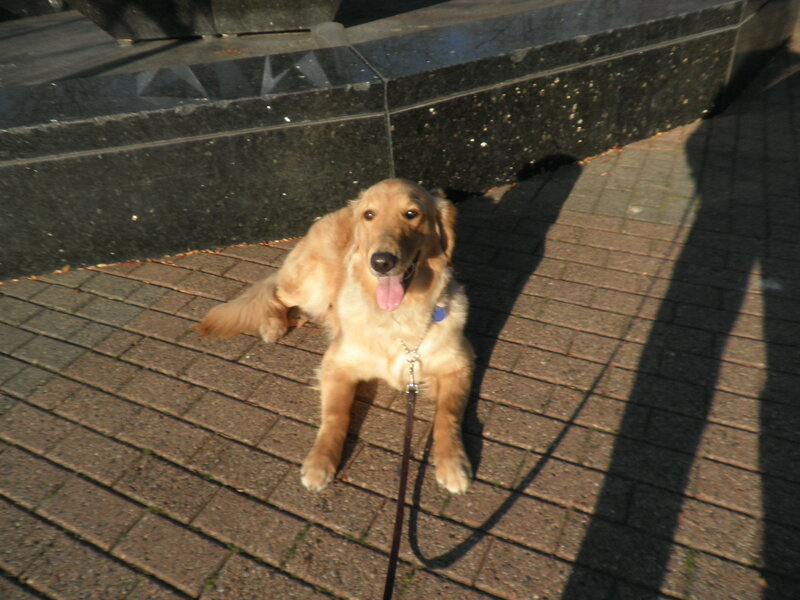 I worked on walking on a loose leash, sit, sit-stay, down & come. By the afternoon of the second day she was working at a level that would allow me to start taking her places. See How Good I Can Be. Now working on the jumping is 24/7. Every time she got out of the crate, running around outside and even a little in the house, she was ready to jump and I was ready to correct. The good news is that her jumping is getting less and less frequent. Once again her jumping is a way to control the situation. If she doesn’t like what you are doing she jumps, if she doesn’t want to do an exercise she jumps and if she is overly excited she jumps. After the first two days it was time to start socializing her. Shyness can be expressed several different ways. The most common is that a dog will tuck their tail under their legs with ears down and not make any eye contact. They may try to move away when someone approaches. Another way is a dog that really wants to say HI, but is afraid or not sure of how to act. Their tail may wag, but as soon as someone goes to pet them. The dog will turn into a mop. They will suddenly flop down, wiggle all over the place and perhaps submissive urinate. The head will toss back and forth and try to avoid eye contact. This was Casey’s style. So it was essential that she be socialized in a controlled setting. Our first trips were to different pet stores. The environment at a pet store will have lots of distractions, but will also be quieter and not as many people. The good news is that by the end of the visit to the second store, she was calming down and not so nervous. The next phase was to take her to the city. I took her to Royal Oak and Birmingham. These would be short jaunts in the car which will let her get used to driving in a car. There was only one time that she got sick and that was actually the second time I took her anywhere. I am glad to say that I am seeing an improvement each time we go. Today my plan is to take her to Rochester. The drive will be the longest she went on and it is my hope that she doesn’t get sick. She is improving each day and I have high hopes that she will be fine. Entry filed under: Dog Behavior modification, Dog Training, Hyper Dog, Jumping, Socializing a Dog.